New obesity-related mechanism identified in the development of Type 2 diabetes. It’s been known that in the presence of obesity, the endoplasmic reticulum (ER) dysfunction is unable to perform one of its key functions: initiating a cascade of intracellular events called the unfolded protein response (UPR), which relieves ER stress and restores function. While the mechanisms that incapacitate the ER in chronic diseases have remained enigmatic, it was generally assumed that ER dysfunction led to inflammation. Now, according to the new study from the Harvard T.H. Chan School of Public Health the sequence may be the opposite, it is obesity-related inflammation that impairs the UPR response and thus ER function. The new findings describes a molecular mechanism that helps explain how obesity-related inflammation can lead to type 2 diabetes. The findings describe a surprising connection between two molecular processes that are known to be involved in the development of metabolic disease, inflammation and ER, and suggest that targeting this connection could aid in the development of new therapies. The study is published in the journal Science. Specifically, the researchers studied liver cells to show that obesity-associated inflammation can lead to increased production of nitric oxide (NO), a powerful gas that can cripple the ER, an organelle, or ‘mini-organ’, inside cells that plays a key role in the synthesis of many proteins and lipids. Proper ER function is critical for the liver and other organs to maintain proper glucose levels in the body. The researchers outlined the sequence of events that results from obesity-related inflammation. First, the inflammation leads to increased NO production. The NO, in turn, modifies an enzyme called IRE1 that is involved in the UPR. The result is the failure of the UPR to restore ER function, leading to insulin resistance and type 2 diabetes. In an innovative approach, the researchers engineered a form of IRE1 that could not be modified by NO, and found that it protected against the detrimental consequences of inflammation and improved metabolic control in obese mice. The team surmise that these results establish that in an environment suffering from chronic inflammation, cellular organelles lose their vitality through a specific link that is identified in the current study, and suggest that therapies that target inflammatory pathways, including nitric oxide production, could be effective strategies in the treatment of metabolic disease. The unfolded protein response (UPR) has been implicated in ER stress-induced autophagy, thus implicating autophagy in ER homeostasis. Potential actions of autophagy in stress recovery could include degradation of misfolded proteins and the promotion of ER turnover. 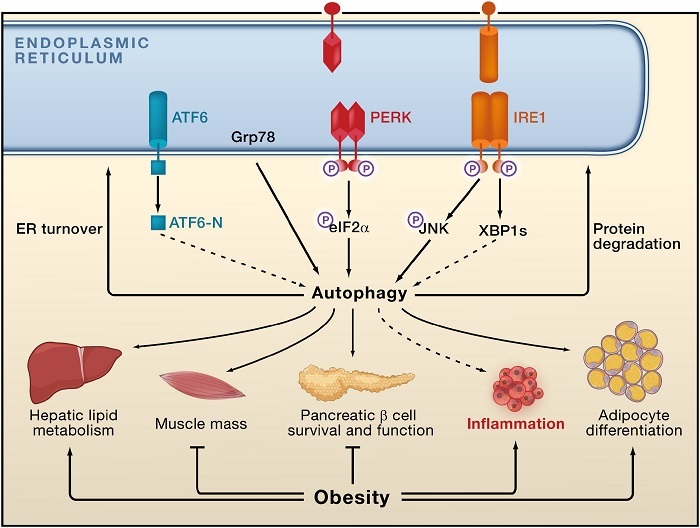 Autophagy may also be involved in lipid droplet formation in the liver, β cell survival and function, adipocyte differentiation, muscle mass regulation, and inflammatory responses, all of which are disturbed in obesity. A role for autophagy in insulin action is not known. Endoplasmic Reticulum Stress and the Inflammatory Basis of Metabolic Disease. Hotamisligil et al 2010.